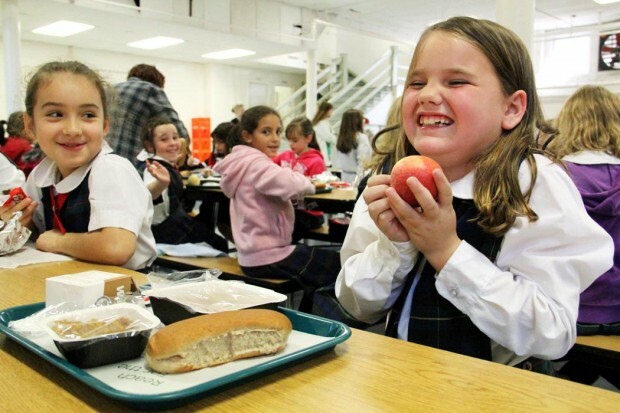 Third grader Bryanna Cunningham enjoys her apple during lunch as Saint Cecilia School in the city's Fox Chase section. Theresa George, who is the program coordinator at Saint Cecilia School for the hot lunch program, helps seventh grader Meredith Elliott get her lunch. Nutritional Development Services (NDS) of the Archdiocese of Philadelphia celebrates National School Lunch Week with a special day at one of its newest school partner sites, St. Cecilia in the Philadelphia’s Fox Chase section. Students received nutrition puzzles, coloring sheets and stickers at an event at the school Oct. 18 to remind them of the importance of eating healthy at school and at home. A proclamation celebrating National School Lunch Week was also read at lunchtime in the school cafeteria. 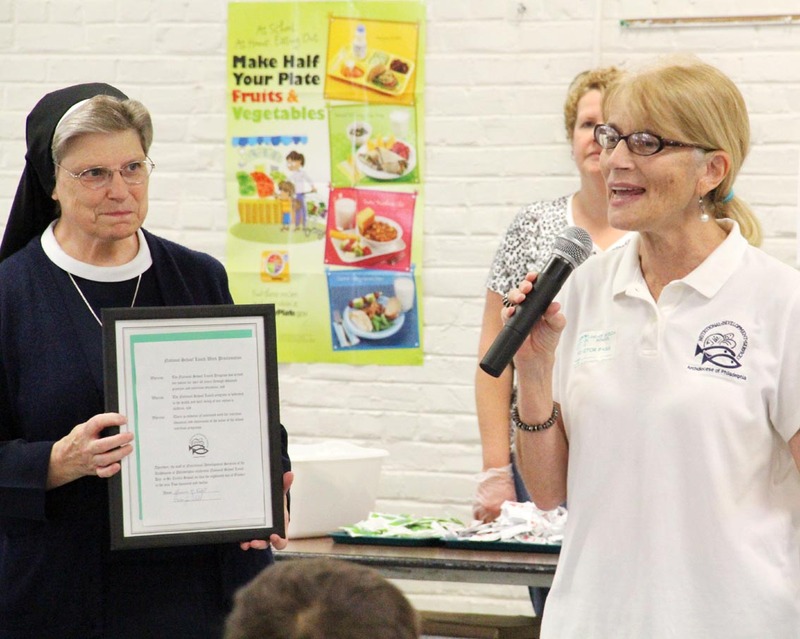 St. Cecilia’s joins 110 other Catholic elementary schools, as well as charter and private schools in the five-county-area, making healthy meals available to its students under the sponsorship of Nutritional Development Services. 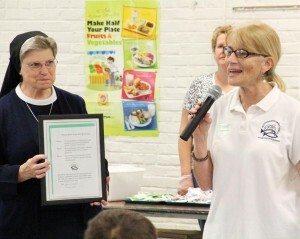 Sr. Jane Mary Carr IHM was presented with a proclamation celebrating National School Lunch Week by Anne Ayella from NDS. Serving more than 31 million children every school day, the federally-funded National School Lunch Program provides nutritionally balanced, healthy meals to students. The program, which has been serving America’s children for over 60 years, requires school meals to meet the USDA’s new nutrition standards by: ensuring students are offered both fruits and vegetables every day of the week; substantially increasing offerings of foods rich in whole grains; offering only fat-free or low-fat milk varieties; limiting calories based on the age of children being served to ensure proper portion size; and increasing the focus on reducing the amounts of saturated fat, trans fats and sodium.